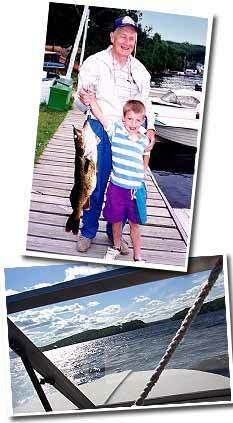 Fishing is still one of the most popular activities at Birch Cliff Lodge. The thirty five kilometers of waterways in the Baptiste Lake system are populated with a variety of fish. It is an excellent bass lake with Molson trophy winning bass (both large and small mouth), as well as good populations of walleye, Northern pike and muskie. There are even lake trout in the deeper water and of course lots of pan fish. Fifty years ago most fishing parties went out with a guide who usually cooked a shore lunch with his guests. Times have changed, but if you give us advance notice we can still arrange for a guide to accompany you. Fishing tackle and live bait are sold at the Birch Cliff store. The Baptiste Lake system is one of the prettiest in Ontario. Set in the high, granite hills of North Hastings and Haliburton, Baptiste has long been a favourite of painters, photographers and nature lovers. The miles of navigable waterways extend through Elephant and Benoirs Lakes into Algonquin Park. Take an all day boat trip to Upper High Falls, a picnic to Lower High Falls or a hike to the top of Blueberry Island for the spectacular view, with the further reward of a pail full of blueberries. Naturalists will enjoy a paddle along McGarry Creek with its wild flowers and extensive bird life.